In 2000, the foreign-born population ages 16 years and older stood at 28 million, a 61% increase since 1990 and clear evidence of the surge in immigration during the previous decade. The most significant gains, in percentage terms, took place in states that had comparatively small foreign-born populations in 1990 and drew new flows of immigrants over the course of the decade. The fastest growth occurred in North Carolina, where the foreign-born population in that age group increase 278% by 2000. Georgia and Nevada each also grew by more than 200% (Table 1). In all, in 18 states the foreign-born population 16 and older grew by at least 100% between 1990 and 2000. States that for decades have been home to significant number of immigrants also experienced an increase in the foreign-born population 16 and older by 2000. But even though the number of foreign born added to the population was large, the percentage increase was comparatively smaller. For example, in California, the state with the largest foreign-born population, the number of immigrants 16 and older increased by 2.5 million people. While that was the most of any state, it produced a growth of 44% because the population was already quite large at the start of the 1990s. Other traditional destination states for immigrants include Florida, where the foreign-born population 16 and older grew 63%, Illinois (62%), New Jersey (54%) and New York (39%). Between 2000 and 2004, a period that included a recession, an extended economic slowdown and the start of a recovery, the increases in the foreign-born population 16 and older generally followed the geographic pattern set in the expansion years of 1990s, with some variations. The 10 states with the fastest growth between 2000 and 2004 had all experienced increases of 100% or more in the foreign-born population 16 and older in the 1990s. 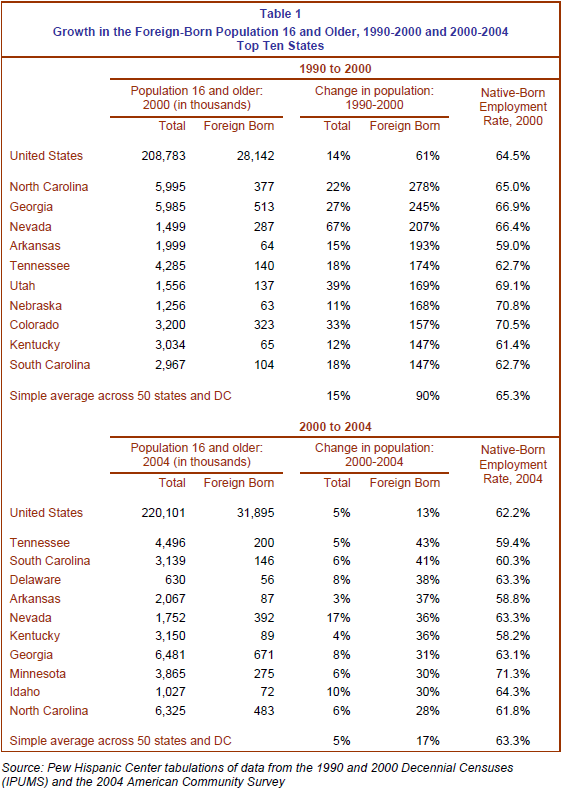 For example, in Tennessee, where the foreign-born population 16 and older increased 174% between 1990 and 2000, that population grew by an additional 43% by 2004 (Table 1). States with significant concentrations of foreign-born workers experienced comparatively more modest growth. The simple average of growth across all states and the District of Columbia was 17% between 2000 and 2004, when the total foreign-born population 16 and older reached almost 32 million. Is above-average growth in the foreign-born population associated with worse-than-average employment outcomes for the native-born population? As a prelude to the more formal analysis in the remainder of the report, Table 1 shows the employment rates in the 10 states with the fastest growth in the foreign-born workforce. It is clear that the employment outcomes for native-born workers in these states were significantly different. For example, employment rates for native-born workers were below average in several of the states with the highest growth in the foreign-born population between 1990 and 2000. Those states included Kentucky, whose employment rate for native-born workers in 2000 was 61.4%, and South Carolina, where it was 62.7%. Both are well below the across-state average employment rate of 65.3%. On the other hand, the employment rates for native-born workers in 2000 were better than average in other states, including Georgia (66.9%) and Nevada (66.4%). Those different outcomes for native-born workers also occurred between 2000- 2004. The rapid growth in the foreign-born population was associated with below average employment rates in Arkansas, Kentucky and South Carolina. On the other hand, several states with fast-growing foreign-born populations, such as Minnesota and Idaho, had above average employment rates for native-born workers. Table 1 shows that high rates of growth in the foreign-born population are not necessarily associated with worse employment outcomes for native-born workers. Another way of addressing the question is to examine whether better employment outcomes for native-born workers are linked with relatively slow rates of growth in the foreign-born population. Table 2 shows the 10 states that had the highest employment rates in 2000 and 2004. It is clear that these states had significant differences when it came to rates of growth in the foreign-born population. For example, between 1990 and 2000 the growth in the foreign-born population exceeded 100% in several states with high employment rates for native-born workers. Those include Minnesota, with an employment rate of 73.1% in 2000, Nebraska (70.8%), Colorado (70.5%) and Utah (69.1%). On the other hand, New Hampshire, Wisconsin, North Dakota and Wyoming are among the states where high employment rates for the native born were associated with relatively slow growth in the foreign-born population between 1990 and 2000. These differences in the growth of the foreign-born population are also evident between 2000 and 2004. During these years, the change in the foreign-born workforce was relatively high in Minnesota, North Dakota and Wyoming, but it was relatively low in Kansas, South Dakota and Vermont. Yet, all of these states are ranked in the top 10 with respect to growth in the foreign-born population from 2000 to 2004. Overall, the weight of the evidence presented in Tables 1 and 2 shows that there is no consistent relationship between the growth in the foreign-born population and employment outcomes for native-born workers. As a result, it is not possible to state with certainty whether the inflow of foreign-born workers has hurt or helped the employment outlook for native-born workers. The remainder of the study presents a more detailed analysis of the relationship between the growth of the foreign-born population and employment outcomes for the native born during 1990 to 2000 and 2000 to 2004. The analysis charts the growth of the foreign-born workforce in a state over a given time period against three measures for native-born workers—employment rate, labor force participation rate and unemployment rate—at the end of the time period. That establishes the relationship between the pace of immigration and employment outcomes for the native born. The analysis also explores the relationship between the share of foreign-born workers in the workforce of a given area and the employment rate for native-born workers. That establishes the relationship between the size of the foreign-born presence in a state’s workforce and a key outcome for the native born. Finally, the report presents evidence on the impact on native-born workers ages 25-44 or with low levels of education. Those traits were shared by the majority of foreign-born workers entering the U.S. during the periods of analyses.